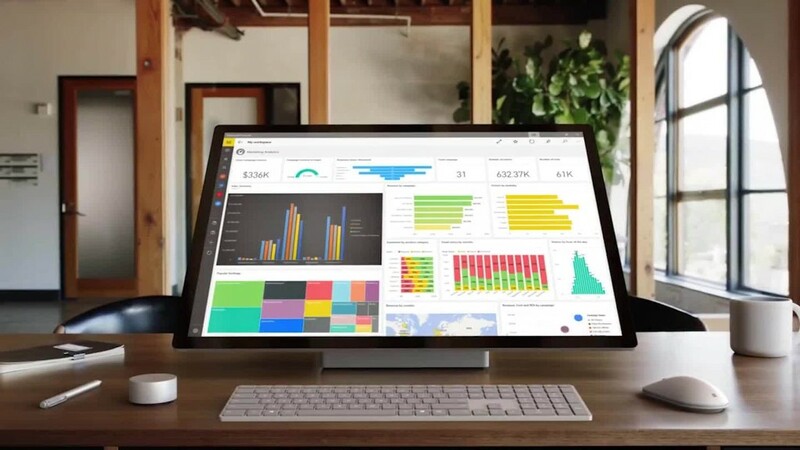 Microsoft aims to lure designers away from Apple with its new Surface desktop computer. The company showed off a collection of shiny new tech products Wednesday morning ahead of the holiday shopping season. As expected, Microsoft (MSFT) debuted an all-in-one Surface PC called Surface Studio ($2,999), which has a strong focus on creativity. It's clear the company wants users to start thinking of its products as more than just productivity tools. While the tech giant has launched tablets and laptops under the Surface branding, this is the first time its landed on a desktop computer. 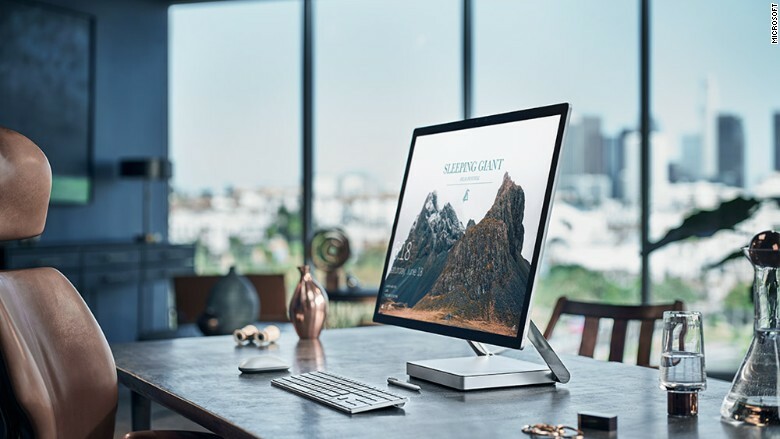 Surface Studio includes a hinge that lets you tinker with the display angle and supports touchscreen and stylus capabilities -- similar to what's already standard for other Surface products. Microsoft said its 28-inch display is the thinnest LCD monitor ever made at 12.5 mm. The computer comes with a powerful four-core i7 chip, 2TB hard drive, an HD camera and 13.5 million pixels -- more than double that of a 4K TV. There's also a built-in microphone that lets you talk to its voice-assistant software Cortana from across the room. Microsoft Studio will be available in limited quantities for the holidays, but the company didn't specify a launch date. The news comes one day before Apple hosts its Mac-centric product launch in San Francisco, where we'll likely see a new MacBook Pro and possibly an updated iMac desktop. 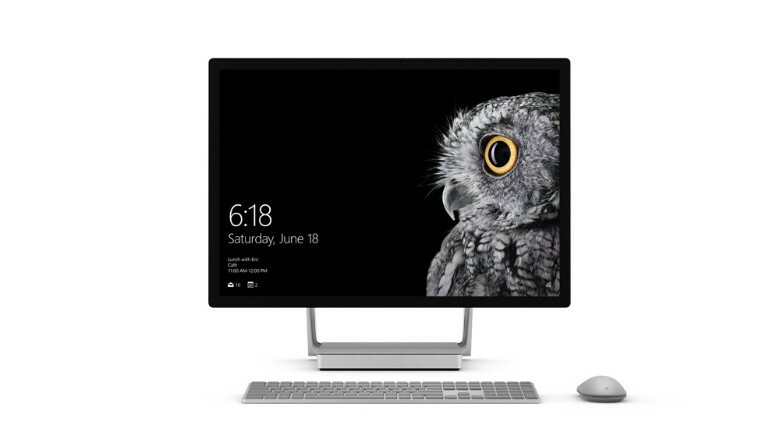 To compliment the Surface Studio, Microsoft introduced an accessory called the Surface Redial that "turns your desk into a studio." The circular device responds to touch and works alongside the Surface Pen stylus. After tapping it, it's possible to rewind your progress, whether it's typed text or a drawing, and adjust colors in real time. 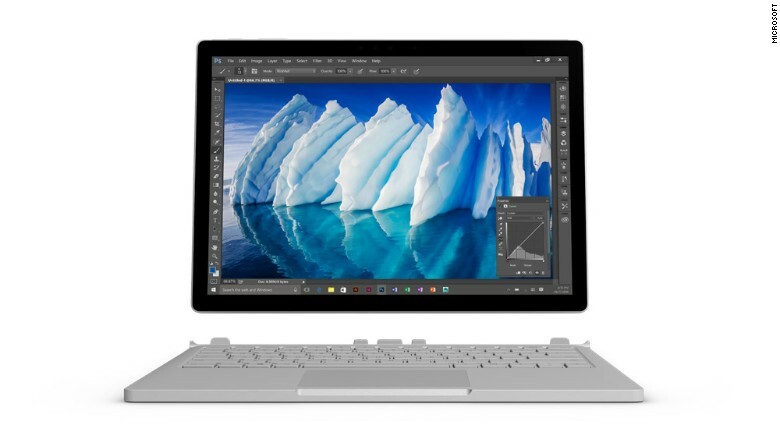 Meanwhile, in a surprise announcement, Microsoft also introduced the Surface Book i7. The laptop comes with 30% more battery life than its previous Surface Book -- about 16 hours of battery life on a single charge. The company says it has three times the graphics performance of the 13-inch MacBook Pro. Priced at $2,399, the device starts shipping in November. But there's a lot more coming from Microsoft than just hardware. The company also unveiled its next-generation Windows software -- called Windows 10 Creator Update -- which has a greater focus on creativity. It also touts virtual reality, augmented reality and 3D support. The update will be available to all Windows users next year. According to the company, more than 400 million people currently use Windows 10. To start, it revealed an updated version of its iconic Microsoft Paint. Microsoft Paint 3D lets you take photos of physical objects on your smartphone and upload it to the platform. From there, you'll be able to customize the images in 3D and print them out. The company is also throwing a 3D option into PowerPoint, so you can spin pictures of objects on screen during a presentation. An upgrade to the Microsoft Edge browser will support 3D, too. The operating system is also getting more social. It's adding a tool to make sharing articles, pictures and messages easier. You'll be able to add your most important contacts to your desktop, and Microsoft will filter your Mail and Skype messages according to what it thinks you'll want first. Microsoft also announced a new collection of VR headsets, starting at $299, from a series of partners like HP (HPQ), Dell, Lenovo, Acer and Asus. Few details were revealed about the products, but they'll be available next year. The company spent an ample amount of time on stage highlighting its vision for the future of gaming. As a part of Windows 10 Creator Update (via its Xbox app), users will broadcast the games they're playing in real time -- a move that takes on popular gaming network Twitch.